Millefiori glass designs from the isle of Murano are made with various layers of color to create beautiful flower-like patterns. Literally meaning “a thousand flowers” they originated from ancient Roman, Alexandrian and Phoenician glassware. Falling out of use over time, the technique was re-introduced by Murano glassmakers in the nineteenth century. Soon factories in England and France began producing this style of glassware. Many of these pieces became collector’s items, particularly paperweights. Murano glassmakers began to incorporate the different patterns into beads and jewelry pieces, which are very popular today. Production of of this glass is a complicated and skilled process. Molten glass is attached to a metal pole and dipped into different colors and using special molds the glass is shaped to produce the varying patterns. The colored glass is then encased in an outer layer of glass and stretched to become a fine rod. The rods are sliced into small pieces and the internal patterns revealed. Because of the process involved no two rods are the same. Transparent and opaque patterns can now be purchased in different COE’s today, 96 COE, 90 COE and 104 COE. These COE’s cannot be used together and must be kept separate. When buying this product you will find that the ends may be uneven, you can grind the ends square before fusing, if you wish. If you are going to mash them it is advisable to have them even. 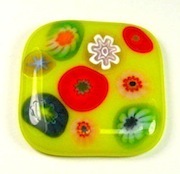 although uneven pieces can be fused in a glass kiln without any difficulty. 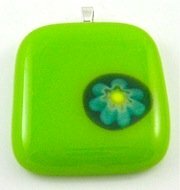 This fused glass pendant is made from two pieces of Bullseye COE 90 glass along with one COE 90 millefiori. The pieces are stacked together, the small piece is placed on top and then the glass is fused. As you can see the end result is a nicely fused pendant. You can fire multiple pieces onto a base glass in one firing. If using multiple pieces allow room for the pieces to expand as they fuse into the base layers. Suitable for pendants, earrings, bracelets, brooches etc.They can be used in a wide range of designs as they come in a variety of sizes, patterns and colors. 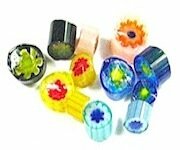 To date there are not many genuine Murano millefiori on the market, most being reserved for bead and jewelry production at Murano. However, the products that are available are good quality and will produce nice results.